Stormspell Records has picked up this band hailing from Puorto Rico. 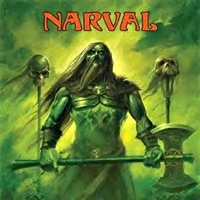 As far as I know a Narval is the French name of a kind of sword-fish. What this has to do with metal I don't quite understand, but what's in a name? The music they serve us is a combination of true, classic, doom and a bit power metal. Nothing wrong so far I would say, but the biggest problem I have with this CD is the vocals. The band finds its inspiration in bands such as Rainbow, Warlord, Uriah Heep, Deep Purple, Black Sabbath and Manowar. They don't however never get on the same level as any of them. You can hear that they have tried to make a mixture, but they have not yet the same song writing skills. The song "King of Dreams" is even an ode to one of their heroes: Ronnie James Dio. I think Ronnie would advice singing lessons or a new singer. With the tons of releases every month you have to come up with more than this if you want metal fans to buy your album. With the first album they failed to pass the exams, but they deserve a retest with the next one. You should only give this one a try if you can look past the vocals.